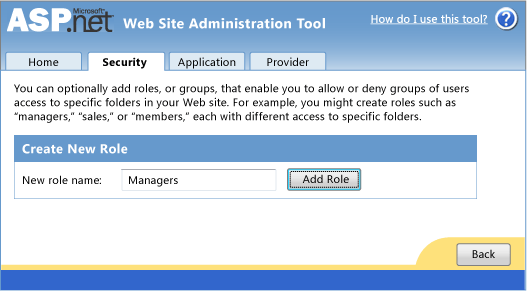 In this walkthrough, you learn how to set up your server and client projects in an WCF RIA Services solution to work with an authentication service. When you create a solution with the Silverlight Navigation Application template and enable RIA Services, you can access the ASP.NET Membership framework by adding an authentication service. The authentication service exposes authentication, roles, and profiles from the server project to the client project. You use the authentication service to validate user credentials, restrict access to resources based on roles, and store profile properties. The Silverlight Business Application automatically implements the authentication service. 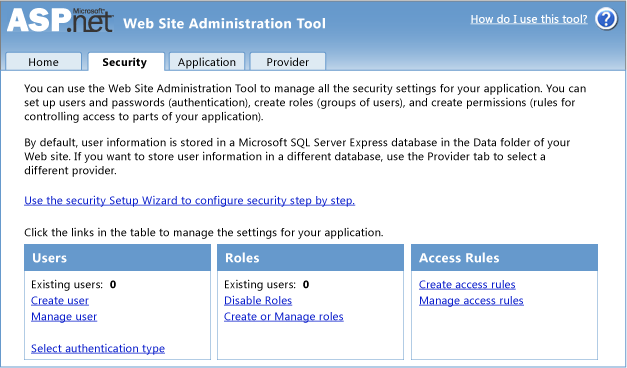 For more information, see Walkthrough: Using Authentication Service with Silverlight Business Application. To use the authentication service from a Silverlight application, you must configure the authentication on the server project. You configure authentication in the Web.config file. After configuring authentication, you can also configure roles and profiles on the server project, if you want to use those features from the Silverlight application. In this walkthrough, you will configure all three features. Finally, you add an authentication service which exposes the enabled features to the client. Select the Silverlight Navigation Application template and name the application ExampleNavigationApplication. Make sure that the Host the Silverlight application in a new Web site check box is selected and that the New Web project type is set to ASP.NET Web Application Project. Select the Enable WCF RIA Services check box. In the server project (ExampleBusinessApplication.Web), open the Web.config file. In the <system.web> element, add an <authentication> element and set the mode property to Forms. In the <system.web> element, add a <roleManager> element and set the enabled property to true. In the <system.web> element, add a <profile> element, set the enabled property to true, and include a profile property named DefaultRows. The completed <system.web> element should include the following elements. In the Solution Explorer, right-click the server project, select Add and then New Item. Select the Authentication Domain Service template and name it AuthenticationDomainService. Open the authentication service code file (AuthenticationDomainService.cs or AuthenticationDomainService.vb) and add the DefaultRows property that you defined in the Web.config file to the User class. 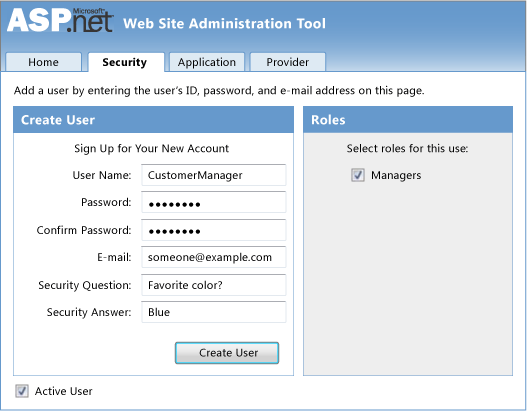 In this section, you will use the ASP.NET Web Site Administration Tool to create a user and role. You will login as this user in a later section. To open the ASP.NET Web Site Administration Tool, first select the server project in the Solution Explorer. Select the Security tab in ASP.NET Web Site Administration Tool. Add a new role named Managers and click the Add Role button. You must configure the client project to use the authentication mode that matches the authentication mode you configured in the server project. In the constructor, create a new instance of the WebContext class. Set the Authentication property to a new instance of the FormsAuthentication class, and add the WebContext instance to the ApplicationLifetimeObjects. In this section, you will add Silverlight controls that enable the user to provide user name and password for logging in. You will add code that calls the Login method with the user's credentials. You will also set which controls are visible based on whether the user is logged in. 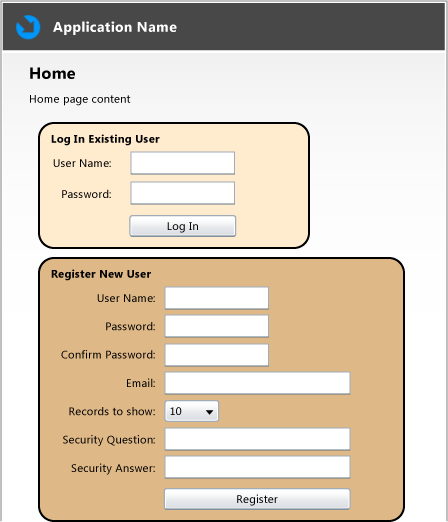 For simplicity, the login user interface is added to the Home page in this walkthrough. In your application, you may want to create a separate login page. In Solution Explorer, expand the Views folder in the client project. After the TextBlock named ContentText, add the following XAML. The XAML includes a TextBox for providing a user name, a PasswordBox for providing a password, a Button for submitting the login request, and a TextBlock and HyperlinkButton for logging out which are only displayed after the user has logged in. Open the code-behind file for the home page (Home.xaml.cs or Home.xaml.vb). Add a using or an Imports statement for the System.ServiceModel.DomainServices.Client.ApplicationServices namespace. Add the following code to the Home class. The code includes event handlers for logging in and logging out, callback methods for completed login and logout operations, and a method that set the visibility of controls based on whether the user is authenticated. Log in as CustomerManager with P@ssword for the password. 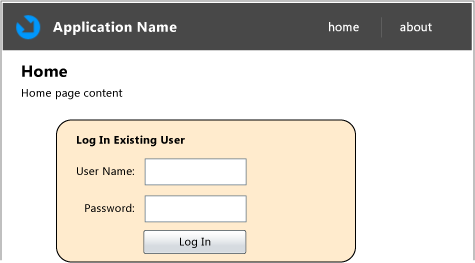 Notice that the Login area is no longer displayed, but the welcome text and logout link are now displayed. Click Logout link and close Web browser. The authentication service does not contain an operation to create new users. To register a new user, you create an empty domain service and add an operation for adding a user to the ASP.NET Membership framework. In the server project, add a new class file named NewUser. Define the properties for registering a new user by adding the following code to the NewUser class. The ConfirmPassword property in the previous step is defined with a CustomValidationAttribute attribute. In the attribute, it specifies a RegistrationValidator class and a method named IsPasswordConfirmed. You must now define this custom validation class. Add a new class named RegistrationValidator.shared.cs or RegistrationValidator.shared.vb. Add the following code to the RegistrationValidator.shared file. 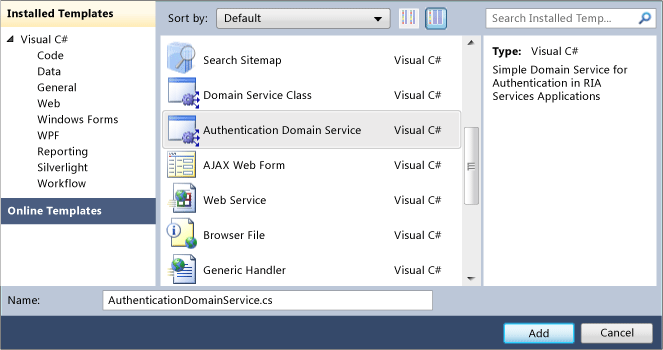 Add a new item to the server project and select the Domain Service Class template. Name the file RegistrationDomainService.cs or RegistrationDomainService.vb and then click the Add button. 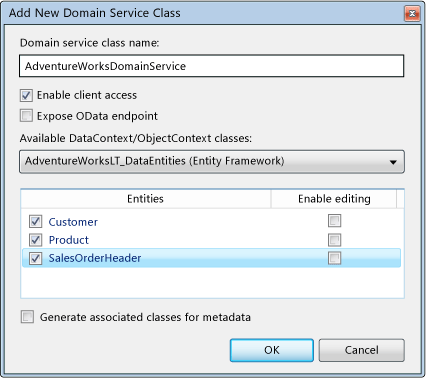 In the Add New Domain Service Class dialog box, select <empty domain service class> from the Available DataContexts/ObjectContexts list. To create a domain operation that adds a new user through the Membership framework and saves a profile property, add the following code to the RegistrationDomainService class. The GetUsers method must be included to ensure that the NewUser entity class is generated for the client project. Only classes that are exposed through a public query operation are generated in the client project. After creating the user, the profile property named DefaultRows is set. In this case, the profile property is set as part of the domain operation for creating a user. In a later section, you will add code to set the profile property from the client project. After the end tag for the LoginBorderBorder control, add the following XAML to create a second Border control with input controls to collect information for creating new users. The controls accept values for user name, password, password confirmation, e-mail address, security question, security answer, and the number of records to show on reports. The number of records to display will be saved as a profile property. All of the other values are used to create the user through ASP.NET Membership framework. Open the Home.xaml.cs (or Home.xaml.vb) code-behind file. Add a using or an Imports statement for the System.ServiceModel.DomainServices.Client, System.ComponentModel.DataAnnotations, and ExampleNavigationApplication.Web namespaces. Add an event handler for the register button click event and add a callback method for domain operation. The callback method includes code to login the user after successfully creating the user account. Modify the SetControlVisibility method to set the visibility of RegisterBorder, as shown in the following code. The following shows the complete code-behind file. Provide values to register a new user. In Solution Explorer, select the server project and click the Show All Files button. Right-click the App_Data folder and select Include in Project. Right-click the App_Data folder, select Add and then Existing Item. In the server project, add a new item and select the ADO.NET Entity Data Model template. Before calling a domain operation with restricted permissions, you should check that the user has the required credentials; otherwise, an exception is thrown. In this section, you will check the user's credentials and populate from one to three DataGrid controls based on the user's credentials. You will also retrieve the number of records based on a property in the user profile. A default value of 10 is used for users that are not authenticated. This section does not include a way for users to set the DefaultRows profile property, but you will add that in a later section. Open the Reports.xaml file, and add the following XAML inside the Grid tags to match the formatting of the other pages in the site, and to include a HyperlinkButton control that will launch a window for editing a profile property. Name the DataGrid controls ProductsGrid, SalesOrdersGrid, and CustomersGrid and set Margin to 5. Open the Reports.xaml.cs or Reports.xaml.vb file and add using or Imports statements for the System.ServiceModel.DomainServices.Client and ExampleNavigationApplication.Web namespaces. Add the following code to the constructor. This code loads the reports and makes the settings link visible for authenticated users. Add an event handler for the Click event on the settings link. The ProfileWindow will be added in a later step. Select the Silverlight Child Window template and name it ProfileWindow.xaml. In the ProfileWindow.xaml file, add the following XAML to include a ComboBox for selecting the number of rows to display in the reports. In the ProfileWindow.xaml.cs or ProfileWindow.xaml.vb code-behind file, add the following code to retrieve and set the profile property. Notice that when the site starts and you are not logged in, only the products table is displayed on the Reports page. On the Home page, register and log in as a new user. Log out, and log in as CustomerManager. 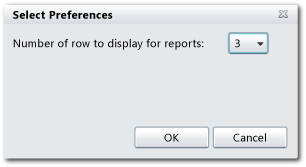 Click the Adjust Settings link and set the default number of rows to show for the reports. Notice that the DataGrid now contains the number of rows you selected.